One of the sites I was really interested in seeing on this trip was the Palazzo Davanzati–a 14th century Florentine palazzo that has been preserved and made into a museum. The idea is to show how rich people back in the 14th C lived. 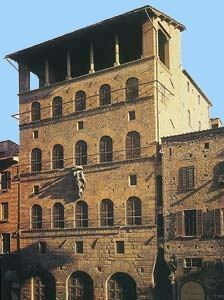 The building itself is impressive – a five story medieval tower with a central courtyard area and an interior staircase. At each floor, an open balcony runs all the way around the central well with the rooms on three sides. I was hoping to get some feeling for how my characters might have lived back in 1340. I gleaned a few interesting things I can probably use although my characters live in San Gimignano and Siena so I’m not sure how similar the dwellings would have been. The overall impression of the place is that it must have been very dark. The windows are not that large and in the 14th C, before they were glassed in, they would either be open to the elements or covered with “impannate,” which are panels made from linen soaked in turpentine and stretched over wood. Presumably, torches would be flaming a lot of the time to provide light, even during the day. Each of the five stories was extremely high–about double one of our stories. As a result, the rooms had extremely high ceilings of painted, coffered wood that added to the overall darkness. 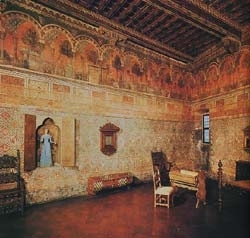 Some rooms had almost no windows at all and were instead adorned with frescos covering all four walls. 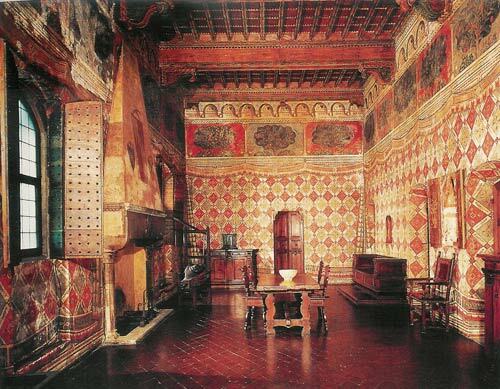 My character will be working on a fresco in the house of a rich family in Siena and so it was good to see the types of subjects used. On all four walls of one room was a massive fresco consisting almost entirely of an abstract pattern containing parrots and painted to look like drapery. This pattern extended to about 10 feet of the ceiling where a continuous row of trees was painted. In another room – a bedroom- a fresco showing a popular romance story from the time completely encircles the top 10 feet of all four walls. Only the first two floors are open to the public to wander through. To get to the top floors, you have to join a tour. I put my name down for the 10 am tour but unfortunately the tour guide only gave the tour in Italian. Fortunately, a French speaking tour guide was translating everything the Italian said to her group. I stood as close as I could to both guides to try to decipher what they were saying and so sort of got the gist here and there. A German woman occasionally translated the odd tidbit into English for my benefit which was very kind of her. The tour went upstairs to the kitchen – la cucina -which was situated towards the top of the house because of the risk of fire. The kitchen was full of a cool selection of medieval kitchen implements – grain grinder, pasta maker, butter churn, etc. I did learn that the women would have done their spinning in an area of the kitchen close to a window (presumably for the light). In the rooms open to the public at least 3 privies had been built in corners between rooms. They were hardly gleaming white porcelain but they were probably relatively warm. Speaking of warmth, every one of the large, cavernous rooms had huge fireplaces which is probably a good indication of just how chilly the place got in the winter. A drawback of the displays in the various rooms was that the bits of furniture and other accoutrements came from two or three centuries. I couldn’t always be sure what was from the 14th century and what was from the 15th or even 16th. As a result, I can’t really depend on what a saw for research purposes but at least I got a general picture and some feeling for atmosphere. After touring the palazzo for most of the morning, I wandered back to the hotel for a short rest. I am so pleased with the location of this place — it really couldn’t be more convenient since it’s literally a stone’s throw from the central core of Florence but across the river and so just enough removed to not feel quite so overrun. The next blog describes my search for the perfect purse (hey – can’t be serious all the time) and my run in with an irate purse seller.